After 73 years Robin’s Book Store, Philadelphia’s oldest independent book seller, is about to: expire, perish, pass away, be taken, resign our being, end our days, breathe our last, depart this life, be no more, pop off, give up the ghost, pay our debt to nature, shuffle off this mortal coil, go the way of all flesh, hand in our chips, come to dust, cross the Stygian ferry, go to Davy Jones’ locker, go out like the snuff of a candle, come to an untimely end, catch our death, go off the hooks, kick the bucket, buy the farm, hop the twig, turn up our toes. Operating a book store was always a better hobby than a way to make a living, but now it is impossible. Blame it on the Economy. Blame it on the Chain Stores. Blame it on the Internet. Blame it on Reading Habits. I’ve enjoyed my visits to Robin’s, although I admit my book-purchasing has slowed to a crawl. The best part about the store was its thriving events calendar. I enjoyed discussions on the Prison Industrial-Complex, how life means life in Pennsylvania, and the glory of the written word. 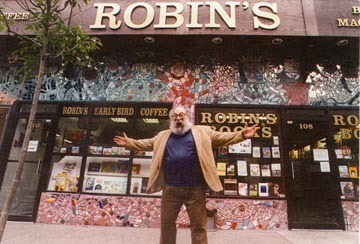 Thankfully, Larry Robin is motivated to continue this tradition, albeit outside of a single venue. I know a world of words and books still exists, so I am creating a social center for poetry and literature, a center city salon where people can meet, listen to interesting presentations, purchase interesting books, have interesting conversations and generally maintain their cultural health. This will exist on a renovated second floor at 110A S.13th Street. Exactly what it will be is up to you. I will still supply books for your events, service your meetings and arrange authors for your organizations. You can still get any book published or out of print from us delivered to your home. Paul Hogan will continue to purchase and trade used books and libraries at 110A S. 13th Street. He can still be reached at 215-567-2615. I plan on increasing our web presence and continuing to arrange author events at other venues: African-American authors at the African American Museum of Philadelphia; Asian-American authors at the Asian Arts Initiative; authors of books on history at The Historical Society of Pennsylvania; etc. If you have a book club or an organization that is interested in author presentations, please contact me.